June 2010 | Follow us ! At our arrival in Malaysia, it felt good to recover the feeling of backpacking rather than being in a huge tourist theme park. At first sight, people here look a lot like their northern neighbors, are as kind and respectful as them and even more smiling. But the similarities do not go much further than that. Starting by religious beliefs, where Thais are mainly Buddhists, most Malaysians are Muslims. Many women wear coloured hijabs (headscarfs), although some of them are, at the same time, profusely maked-up, clothed in tight-fitting outfits and walking on top of heels that would probably make me dizzy. Secondly, a good chunk of the population is of Indian or Chinese origin. Those who were not muslim have kept their Hindu and Buddhist beliefs alive. And, of course, they have contributed with their genes, their clothing and their culinary specialties to the mix, producing an interesting melting pot. While walking around Georgetown, we discovered three adjoining houses, one Muslim, one Hindu and one Buddhist and we ate fried noodles at the rhythm of the last Bollywood success. The ingredients used in the concoction were 'halal'. All packaged products : tomato sauce, water, shampoo, vinegar, jam and even cooking wear seem to be branded 'halal'. In a country were several religions coexist in harmony, this obsession looks somehow an incongruity as the 'halal' seal, in general, only applies to meat. The whole thing feels more of a marketing strategy than a religious obsession but, still, it makes us wonder if the coexistence is as idyllic as it seems. Malaysia's colonial past has also left its mark in several cities across the country. Being situated along the Strait of Melaka, a strategic passing point of the maritime spice route, first the Portuguese, then the Dutch and finally the English set their views on the area and conquered it. In the capital, Kuala Lumpur, there is even an administrative district built by the English shortly before the independence, some 50 years ago, following a reinterpretation of Islamic style (similar to what the French did in Casablanca, although the final result is a bit different). The country seems to us quite developed. Cities have got abundant greenery, its share of shopping malls, flea markets and museums. Not being junkies of the latter, we actually enjoyed our visits to the National and Islamic Art Museums, as well as the Planetarium in Kuala Lumpur (as a bonus, they saved us from spending outside the hottest hours of the day). Still, overall, despite the charm of colonial towns and the awesome sight of Petrona Towers we think that Malaysian cities are more interesting than impressive. 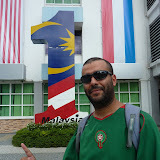 We also spent a good part of our month in Malaysia in the countryside. The Cameron Highlands, in the heart of the Peninsula, allowed us to get away from the oppressive heat of the coast and spend a few days among tea plantations, strawberry-growing greenhouses and evening downpours. Then, after the bustle of the capital, we flew to Malaysian Borneo, where all the star attractions are related in one way or another with nature. We found ourselves one more time cruising along a 'gringo' path, although this time one almost exclusively populated with people traveling for a few months. A good part of Borneo is covered by jungle, even if it is difficult to believe it when confronted to endless extensions of palm-oil plantations. We spent a couple of days in a camp in the banks of the Kinabatangan river screening, from a boat or on foot, the sparse jungle spread along the river in search of orangutans, Proboscis monkeys, birds, frogs and other animals. After just a few minutes under the intense humidity of the place we were a sweaty mess. But since using the muddy water pumped from the river was as unwelcoming as sharing the bath cabins with the hairy spiders living on them (or alternatively with the crocodiles living in the river) we preferred to stay filthy and console ourselves thinking we were living the 'true wild experience'. Back into civilisation and after a short visit to the Orangutan Rehabilitation Center, we moved to the surroundings of Mount Kinabalu. Most people come here to hike the 8 kilometers of steps leading to the mountain top. The number of climbers per day is limited, the price quite exorbitant and since nevertheless we still remember so vividly our Colca Canyon experience, we decided to walk instead along the trails at the foot of the mountain. A very nice hike indeed, even if we had to keep an eye in our boots and trousers checking for leeches. Due to the rains of the eve, we were warned that the little beasts would be lurking around. True enough, the only time we stopped for more than a few seconds, Karim caught two of them climbing up his boot. Along with the orangutans, the other reason that took us to Sabah was to dive in Sipadan. The site is classified as one of the best diving spots in the world and we enjoyed the beautiful corals, giant turtles and reef-sharks, even if the famous huge barracuda school did not come to meet us. We dove as well in the less known Mabul because it was a condition set by the diving shop for them to take us to Sipadan. 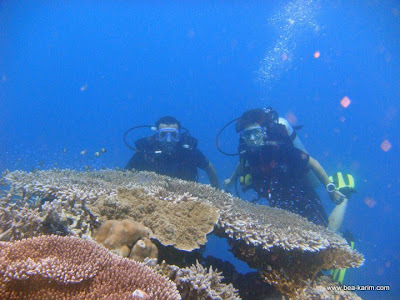 It turned out that, although the place is not as beautiful or the fishes as big as in Sipadan, the variety of aquatic fauna is much higher in Mabul and I personally enjoyed more my dives in there that in its glamorous neighbor. Malaysia has been our introduction to Muslim Est-Asia. We will continue exploring it in our next destination, Indonesia, that we will reach after a brief stop in Singapore.